ELECRAFT KPA/KTA 500 COMBO - $2,425.00 : The Hamstation!, Your one stop on-line source for amateur radio fun. 500+ Watts in a compact package the size of the K3S. The 500-watt solid-state amp that integrates so well with your station, you’ll think it's reading your mind. Exactly the same size as the K3S transceiver, the KPA500 fills out our K3S-P3-KPA500 'K-Line'. 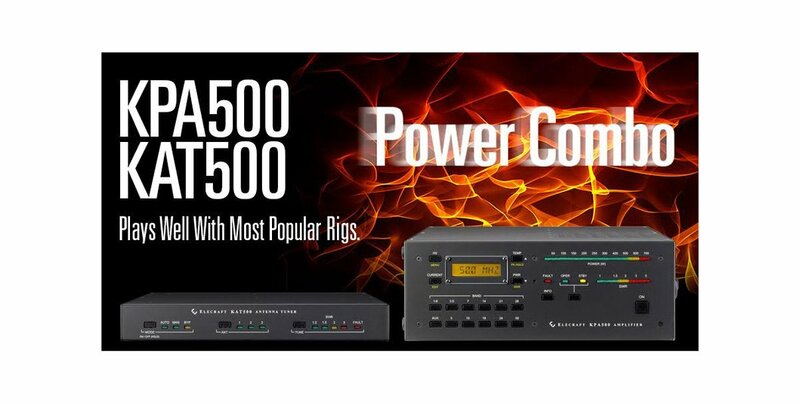 The KPA500 features 160-6M coverage, instant RF-based band switching with any radio, alphanumeric status display, bright LED bar graphs, and a rugged, internal linear supply. The amp’s manual band switches may be used to directly change bands on the K3S. Also the K3S can even select per-band amplifier drive levels automatically when the amp is placed into operate mode, so you’ll rarely need to adjust power output. Works and auto band selects with any radio that provides Key-Out and RF signals. Intelligently reduces power by 2.5 dB temporarily when presented with input overdrive or a high SWR, allowing you to quickly reduce your drive to compensate without dropping the amplifier off-line. The amp automatically recovers to full power once the soft fault condition is corrected. Super fast RF sensing band selection. Only PTT and RF required for fully automatic band changing operation. The K3S senses KPA500 operate/standby state and adjusts drive power between two memorized levels on each band.